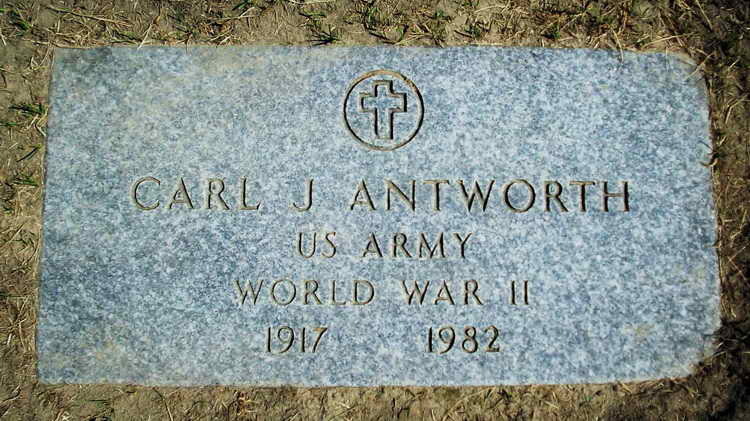 Grave marker for Carl J. Antworth in Section L Row 2 Site 3 of the Maine Veterans Memorial Cemetery, Old Augusta (Kennebec county), Maine. Carl enlisted in the Army at Boston, MA on 19 November 1942 and volunteered for parachutist duty. since the 508th PIR had just been activated at Camp Blanding, FL he was sent there immediately. Pvt Antworth was assigned to the Service Company. Pfc Antworth was later transferred to the Headquarters Company, 3rd Battalion and was awarded the Combat Infantryman Badge for action during the Ardennes campaign, 18 Dec 1944 to 20 Feb 1945.